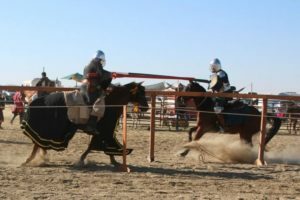 Caid Equestrian is dedicated to the practice of skills at arms on horseback. We also practice and learn basic and essential horsemanship. 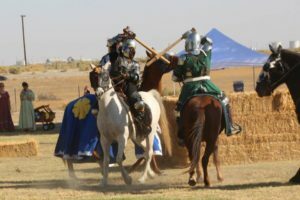 One does not need to own a horse to participate. However, horse sharing is at the discretion of the horse owner. Please be aware that all children must have a parent or guardian with them during practice. Tumbleweed Ranch,13315 Willow Road, Lakeside CA, 92040. Swanhill Farms, 8500 Waters Rd, Moorpark CA 93021.